The Boston College Eagles played for the national championship in 1949, taking out Dartmouth, 4-3, for the school's first-ever title. It would be three decades later before a second opportunity, a 5-3 loss to archrival Boston University in 1978. Since 1998, however, no program except Michigan in the '40s and '50s comes remotely close to Eagle supremacy in Frozen Four and championship-game appearances. Last April, the Eagles won their fourth title and third since 2001 in a remarkable seven title-game appearances since the gut-wrenching 3-2 overtime loss to -- ironically -- Michigan at the TD Garden in Boston in 1998. The genesis of the record-setting run? 1998 -- Michigan's Josh Langfeld stepped out from behind the net and slid a backhander under Scott Clemmensen's pad at 17:51 of overtime to give Michigan a 3-2 win over BC in Boston's TD Garden. 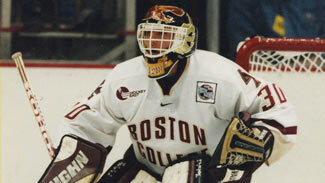 2000 -- BC took a 2-1 lead into the third period against North Dakota before Lee Goren took over with two goals and an assist in the third period en route to a 4-2 win in Providence, Rhode Island. 2001 -- In a rematch with the Fighting Sioux in Albany, New York, BC's Kris Kolanos swooped in alone off a pass from Chuck Kobasew to score the game winner at 4:43 of overtime to give the Eagles their first national championship since 1949. North Dakota had tied the game at 2-2 with two goals in the last three minutes of regulation. 2006 -- Wisconsin eclipsed a 1-0 first-period lead by BC with a goal in the second and third periods to take a 2-1 victory in Milwaukee. Tommy Gilbert scored the winning goal after Robbie Earl tied it. 2007 -- Michigan State rallied with three goals in the third period at the Scottrade Center in St. Louis in the 3-1 final. Justin Abdelkader scored the winner at 19:41 in a crushing Eagle loss. The empty-netter by Chris Mueller sealed the win. 2008 -- Nathan Gerbe took over in Denver at the Pepsi Center with 2 goals and two assists in BC's dominating 4-1 win over Notre Dame, with John Muse shutting the door in goal. 2010 -- Before the largest indoor crowd in hockey history, 37,592, the Eagles won their second title in four years and fourth overall at Ford Field in Detroit with a 5-0 thrashing over favored Wisconsin. Cam Atkinson's two goals and Joe Whitney's three assists led the offensive charge, while then-junior John Muse kept his current record perfect at 8-0 in NCAA Tournament play. "The recruiting wars got tough in the mid-'90s," BC coach Jerry York told NHL.com. "We knew we had to bring in a solid player to rebuild the program." Who was that solid player? "We went after Marty Reasoner hard," said York, into his 17th year behind his alma mater's bench. He honed his coaching resume at Clarkson and then Bowling Green where his team won it all in 1984. "It was between Michigan and BC and he lived halfway between in Rochester, NY. I think he really wanted to lead a program, and Michigan was pretty much a national contender at the time. After arriving for his freshman year in 1995-96, Reasoner and the Eagles would endure two seasons under .500 before the breakout 1997-98 run when they went 28-9-5; the school has not had a sub-.500 season since. "At the time, I think they had some kind of a gap, but it's a great place to go to school and they had a tradition," Reasoner said after a recent practice with the Florida Panthers, his fifth NHL team. "It was more of a shock to me, being recruited so heavy, that they hadn't had more success. It was a great opportunity to play a lot as a freshman and there weren't many guarantees you'd play as a freshman back then. I wanted to play in a lot of situations. That was a big factor." In a program that over the previous three decades sported names like Paul Hurley, Joe Mullen and Brian Leetch, the current 12-year roll began with Reasoner, and was followed with surnames like (Mike) Mottau, (Jeff) Farkas, (Blake) Bellefeuille, (Bobby) Allen, (Scott) Clemmensen, (Rob) Scuderi, (Brooks) Orpik, and BC's all-time goal scoring leader and Canadiens captain Brian Gionta. Mottau would go on to win the Hobey Baker Award in 2000 en route to his current duties on the New York Islanders' blue line, while Gionta remains BC's all-time career goal scorer at 123; his last game was BC's first title-winning game since 1948. "No doubt," said York, "Marty was a key factor in many of those players coming to BC." "There was familiarity with guys out of [upstate New York]," Reasoner said. "Our families knew each other. My brother played with Brian Gionta and I played with Stevie Gionta. So we knew them well. And Jeff Farkas was from Buffalo. They were the first guys from western New York that came that way to BC. A lot of it is that familiarity and how the school sells itself. When we got players to go there who were highly recruited, dominoes fall as far as other guys wanting to go who see the program turning around. "It was going to be a place moving forward and having success." Indeed, BC continued to move forward to the 2006, 2007, 2008, and 2010 title games, led by Cory Schneider, Brian Boyle, Nathan Gerbe and John Muse. The Eagles won it all in the latter two appearances. "The '98 title loss stung bad," Reasoner said about the first domino. "It was in Boston, but we had a great run." Reasoner would put up a scintillating 33 goals and 73 points that junior year as captain on the heels of 45 and 44 points his freshman and sophomore years, validating St. Louis's drafting of him in the first round, with the 14th pick of the 1996 Entry Draft. "We had so many young guys with that freshmen class," Reasoner said. "The Farkas', the Giontas, the Mottaus were counted on to play in key situations. Guys in my class had also played in key situations as freshmen. It all kind of came together. We knew we had a good team. It would have been nice to finish it off. "A lot of it is timing and at that time, I was their top recruit. Everything kind of came together. I owe a lot to Jerry; he gave me that opportunity to play and develop in a lot of different roles." Those roles have served him well at the NHL level after the difficult decision to forego his senior year at the "Heights." "There were a lot of things I wanted to do to progress as a player; test that next level," he said. "You always dream playing pro when you're a kid. It was very, very tough decision. But I did get the degree going summers for about five years." "No surprise, he's lasted so long at the NHL level," York said. "There are only so many Ovechkins. Marty's done a great job of establishing an ability to fill a role on any team that has signed him, and he does it with class." The demure and mature Reasoner learned early and well that his survival and contribution at the NHL level would not replicate his BC stats and status. Defensive play, faceoff proclivity, and a low-keyed but steady locker-room presence punctuate his 646-game NHL career which has featured 86 goals and 234 points. His best offensive season with the Blues, Oilers, Bruins, Thrashers and Panthers was 2002-'03 with Edmonton -- 11 goals and 31 points in 70 games. He is on pace in south Florida to eclipse that mark with 4 goals and 11 points so far in 22 games. Ironically, Reasoner was traded to Boston in March 2006, a month before the Oilers began their eighth-seed run to the Cup finals against Carolina. A month after that seven-game loss, Edmonton re-signed Reasoner as a free agent for a second stint. "Good timing, huh?" he smiled about his lost opportunity to play that deep for Lord Stanley. How has his NHL career adjusted over 13 years? "I'm just concentrating on hanging on as long as I can here and deal with that." What does the 33-year-old Reasoner think about the NCAA route to the NHL? "So many good NHL players come out of college today," he said confidently. "It's a pretty good avenue to take." Reasoner took the Commonwealth Avenue route on which his alma mater is located. 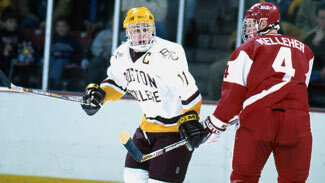 It made a major impact on the current history of the Boston College hockey program.